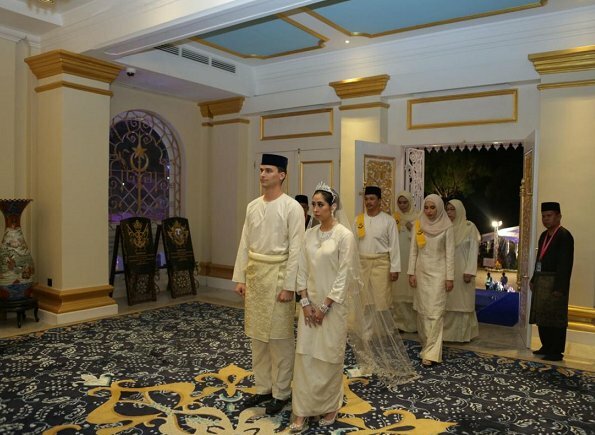 Royal Press Office of Johor released the official wedding photos of Dutchman Dennis Muhammad and Johor Princess Tunku Tun Aminah Maimunah Iskandariah Sultan Ibrahim, after wedding ceremony at the Istana Besar (Grand Palace) in Johor Bahru. 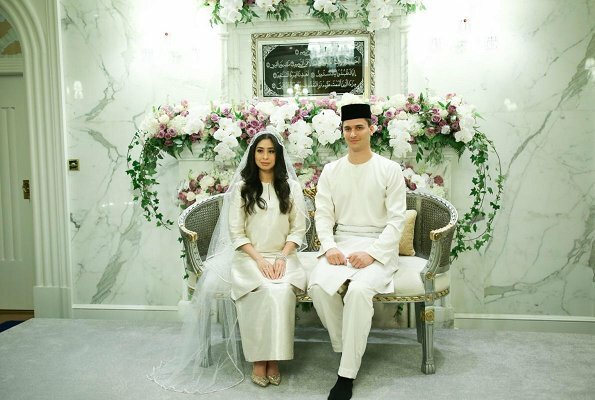 Johor Princess Tunku Tun Aminah Sultan Ibrahim and Dutch-born Dennis Muhammad Abdullah were pronounced husband and wife on 14 August 2017, after their solemnization of marriage according to Malay customs. 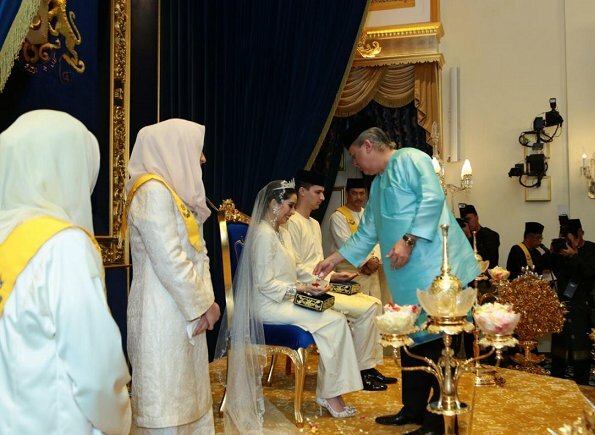 Never heard of them before... but the bride looks lovely. Johor is a part of Malaysia. For those who, like myself, had no idea where Johor is - I googled it and it's a State at the south of Malaysia, near Singapore. Who are these people and why are they here? The flower arrangements are beautiful. Thank you very much Ms.Electra . Apart from European royalties we need to know about the others also. Lovely pics. Asian and African royalty are not as interesting as those in Europe. Beautiful and rich they may be, but still... 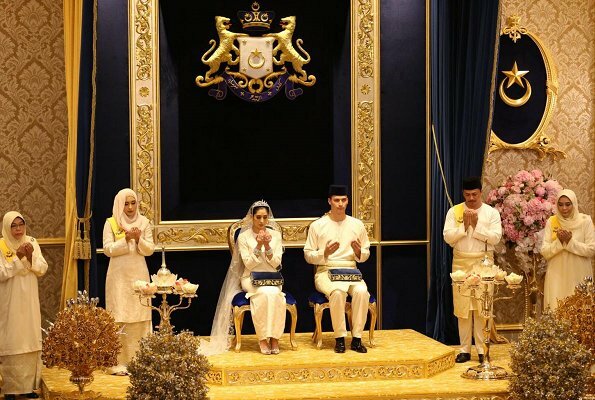 I cannot really see them as really royal. Other Asian Royalties have been featured here - such as Queen Rania of Jordan, Crown Princess Masato of Japan. On the other hand, I have not seen African Royals being featured here. African and Asian royalty are in fact some of the oldest royal houses... your comment is verging on racist and derogatory, these royals are just a royal as any European royal prince or princess. We have to come out from the thought that "western culture" is interesting and fashionable. Every culture is beautiful and has its own fashion that we should respect even if we are not admiring it. I kindly request Ms. Electra to update this blog with African (Swaziland,Lesotho) Asian (Thailand, Cambodia) royalti too. Amnesty International reports of violation of human rights in Swaziland and Lesotho. Also in Thailand and Cambodia. No, Rajashree, I cannot admire beautiful pictures of beautiful royals and separate that from the political situation in those countries. Fashion and culture is not an "innocent" topic. Coralie; actually almost all countries are mentioned in Amnesty International Reports of Violation of Human Rights listing 2015/16. There are also European countries Belgium, Denmark, Netherlands, Norway, Spain, Sweden and UK. Only countries what there are not and from with we read these royal news are tiny countries like Monaco. Luxembourg and Lichtenstein. Also in that list are all those European countries where are no royals today. We cannot blame these royal we watch who have no political power at all what is happening in their countries. Tintomara, your comment really hurt me as an Asian. Please show some respect to the other culture. Most of people in the world like the lifestyle of those people living in Western Countries. The respect of Human Rights in Western Countries is in the higher level than many other countries of the world. This is the reason why Royals in the Western Countries are seen as those who strongly support Human Rights and the socio-economic developments of their countries. If it was possible, many people in the world would like to change their country and live in the Western Countries forever. People are everywhere with the same average level of intelligence, but are the politicians who direct different countries, among of them Royals who support different policies, and based on that some countries are more developed and some others less developed. People admire the development of a specific developed society and tend to love news about them, among those Royals, more than for the other countries. Tintomara must be one of these trolls. If not, what a sad saying. My favorite royals beside of the Swedes and the Danes are the Bhutanis. Lovely country, lovely royal family! I did not wish to offend anyone. However, my interest in Asian or African culture is nonexisting. That does not mean that I do not respect it. It is surely as old and valuable as the western variety. I have nothing against African or Asian people! But take music as an example. I just do not like it! Do I have to do that out of respect? As for the royalty - Thailand? A military terror state? No thanks! What is a military terror state and what does that have to do with their royals? And by declaring a lack of interest in the culture of two entire continents you are hardly being convincing in your argument about not wishing to offend - it's not one big amorphous mass. Not sure how you were hoping to achieve not giving offense by saying African and Asian royalty aren't as interesting or not "really royal". Seems to me you might want to broaden your outlook a bit - you do not like African and Asian music - all of it? Every single type of music produced by a myriad countries across two extremely large continents...? All you're doing is demonstrating your own ignorance and narrow mindedness. "What does a military state have to do with their royals?" Oh, Franny! How can you ask such a question? Actually I asked what a military terror state was. Thailand has a military government, granted, who are not known for their democratic practices by any means - but the Royal Family has been around for far longer. Some of the other royal families may well exist in constitutional democracies but that doesn't mean the royals themselves can't be astoundingly blind at times to real life. My point is royalty is an inherently unfair system - whether it exists within undemocratic societies or not. And I maintain that the original post was deeply culturally insensitive. Google "Thailand" in correlation with "Amnesty International" and then do the same with "Liechtenstein". Oh yes - huge difference! And Franny please stop acting as a kind of PoliticalCorrectness-police. I'm fully aware of the differences between Thailand and Liechtenstein in terms of there governmental differences - and I can use sources more reliable than Google to do so. I didn't say there wasn't a difference. And Coralie - I'm not politically correct and neither was I the only person to find the original comment insensitive. Nor am I acting as the police on this blog. How about you acting as some kind of expert on political regimes around the world? And apparently you can't see the irony in accusing someone of political correctness whilst quoting Amnesty International - physician heal thyself? Coralie; there is also huge difference, Lichtenstein 160 km2 and only 37 000 people, Thailand 513,000 km2 and 66 000 000 people. And I am not a racist! I do not wish to opress certain cultures, I just do not enjoy them myself. And I will much rather read about the European royals than the others. I agree that the young couple fram Bhutan and their little son are lovely, CatchTheScoop. But still, I am entitled to my opinion. This is a very complex topic. Only some weeks ago there was a judgement in Bruxelles concerning eight "princesses" of Abu Dhabi because of slave trade. And although I for one like to look at pictures of Lalla Salma, I cannot forget about the situation in Morocco as far as human rights are concerned. This is quite a difference to Europe. Regarding european royals, we can unhesitating talk about fashion and nothing else. Not so for other regions of this world. Royalty and royal fashion is not an "innocent" topic. Of course I have not heard all Asian music or seen all African artefacts - who has? I just have not enjoyed those that I have sern or heard! And "royals" that exists in opressive, unequal states, military or not, gets no admiration from me. No matter how beautiful or well dressed they are. If it is because of the oppression that you don't admire them then fair enough - but that isn't what your original post said. It said you don't find them interesting and the suggestion was that was because they were African/Asian. Your further clarification did nothing to change that impression because again your statements spoke on broad terms or Africa/Asia as if they were one big amalgam of sameness. Well, they are not royal in my opinion, or at least not as royal as queen Elisabeth for example. I know little about them - how they came to be royal, by what means, for one thing. Elected? Seized power with violence? Of course they are royal to their citizens. I know there are lots of different countries and cultures, not to mention languages, in Africa and Asia. I just happen to prefere Europe. Fair enough. I also tend to follow the Europeans more, largely because that's what I have more access to and have followed since I was a kid. But it's nice that Hellen includes other events and families so she can get more people following her blog. Thank you for your measured responses - sorry if I seemed to be jumping down your throat. Have a good day. Tintomara; I tried to find how this family get to be sultans, well, could not find it. But already 1522 they were sultans, straight line with one exception, one son of law get to be a sultan instead of the wife. So they seem to be really old royal family. What comes to Queen Elizabeth and her decadents, it is far more meander to find the line and goes (in my understanding) to year 1714. Bernadotte in Sweden and Norway go to 1818, Belgian royals 1831, Spanish 1975 (1886 if we count to Alfonso XIII), Danish have even longer history to 1448, Dutch go to 1815. 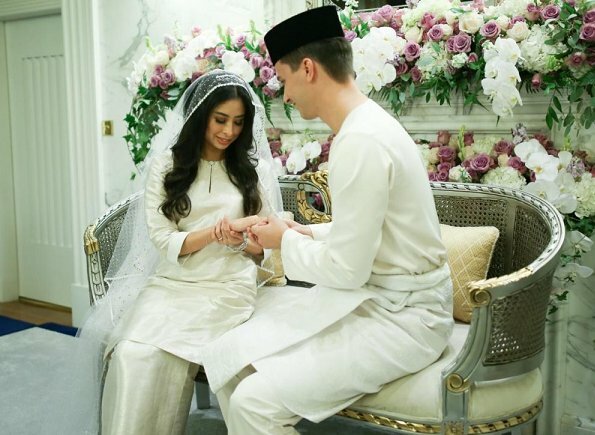 So I would say these Malay ones have quite a pedigree really. I have no knowledge of this royal family but I find it interesting that a princess is marrying a man from the Netherlands named Dennis. Would love to know their story! I just discovered this blog and look forward to learning more about royal fashion all over the world.